Fan favorite Grantchester returns to PBS tomorrow night and Kerry Hammond is here to tell us how excited she is about the new episodes. 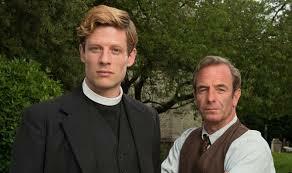 Grantchester is a PBS show based on a series of short stories by James Runcie called The Grantchester Mysteries, and season one of the show contained episodes that were based on the short stories. 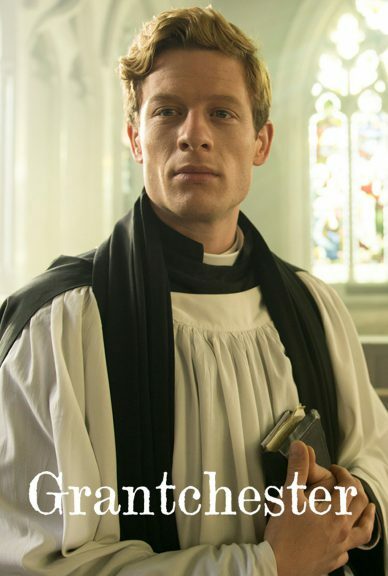 Sidney Chambers (played by James Norton) is an Anglican vicar who frequently helps his friend, Detective Inspector Geordie Keating (played by Robson Green) solve crimes. 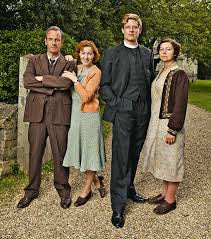 The setting is the 1950s in the rural English village of Grantchester. The cast of characters is diverse: Sidney is a vicar that was in the Scots Guards during the war and experienced some horrific events that have caused him to sometimes drink excessively and be a bit brooding. Geordie is married with several children and is an overworked, sometimes gruff copper. Mrs. Maguire is Sidney’s religious and judgmental housekeeper. 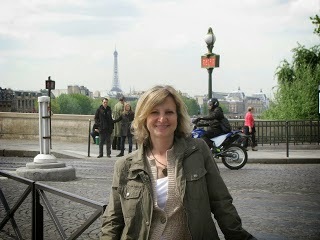 Amanda Kendall is Sidney’s close friend and the one that got away. Dickens is Sidney’s adorable black Labrador. THE FOLLOWING WILL CONTAIN SPOILERS FROM SEASON ONE AND TWO: READ ON AT YOUR OWN RISK. In season one, Sidney finds himself embroiled in all sorts of sticky messes. He reunites with a bunch of school chums when his sister gets engaged, only to be involved in a sticky jewelry theft. He rescues a parishioner from a burning building and then helps Geordie investigate the death of her husband. They even go to a Jazz Club and get involved in a murder. In the finale, Geordie gets shot, Sidney has flashbacks from the war and Amanda is about to marry another man. At the same time, an indiscretion causes Sidney to ruin his relationship with his girlfriend, Hildegard. In season two, Sidney faces charges of sexual abuse, we realize that Amanda’s marriage is anything but happy, Sidney has a new girlfriend, Sidney and Geordie clash over a case and Amanda finds herself pregnant and leaves her husband seeking Sidney’s help. What is in store for season three? We’ll have to tune in tomorrow to find out!